The way we think about careers has changed greatly over the last decade. Our definition no longer describes job tenures with just a few employees. A worker might change career paths multiple times, take breaks to raise a family, try something new, or cobble together work suitable to his or her lifestyle or preferences. Owens’ decisions and attitude represent how many of today’s talented employees are approaching “the art of the hustle” and their careers. They are taking side hustles, contract work, and gigs to improve their skills, support their financial goals, and expand their pursuit of their passions. The shift in how employees find work and the type of work they’re looking for is the driver behind a change in how successful recruiters are looking at résumés and evaluating job experience. Today’s employees are largely motivated to find gig work, and many cite pursuing their passions as the number one reason they held another job, aside from earning more money. Additionally, wanting to get the most out of life, finding more balance, and obtaining financial freedom or more control of their future are all reasons employees choose to find gig work. Recruiters should understand these changing preferences when seeking out prospective employees. Perhaps a résumé, for example, lists out many shorter jobs instead of longevity at one. Maybe the résumé includes a position like “freelancer” but misses the household employer brand you were hoping to see. Avoid sticking too rigidly to a certain length or position at a company because there’s a good chance that an employee who pieced together several gigs still obtained similar—or sometimes better and more diverse—experiences. Owens made it clear that his gig at Trader Joe’s was the perfect opportunity for him to provide for his family because the work hours allowed for a flexible schedule that accommodated prior commitments and alternate job pursuits. The need to earn more money and have a flexible schedule prompted him to take an unconventional path. Ideally, recruiters should see this hustle as a sign of a hard-working and well-rounded employee while taking into consideration the unique experience each prospective employee faces. As more people enter the gig economy, we see a shift from the traditional employment mentality to a more business-oriented, entrepreneurial mind-set. 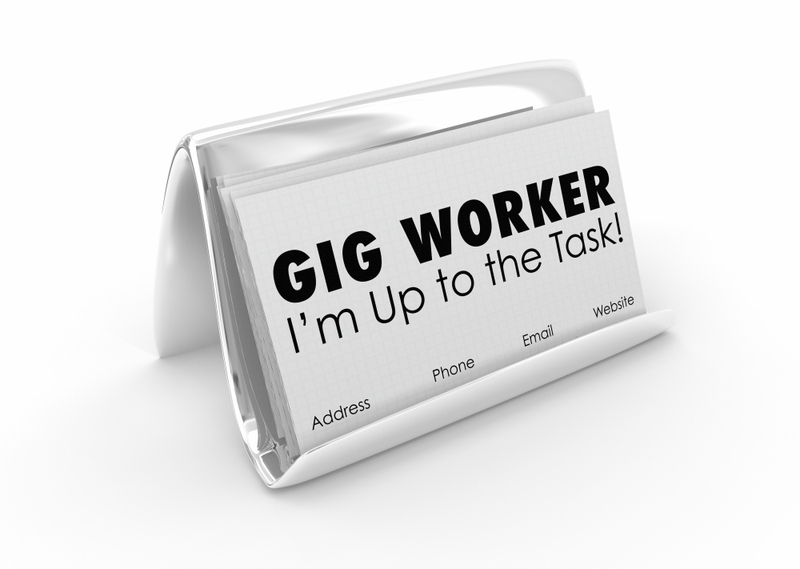 Workers who have held multiple gigs likely took the time and energy to network and pursue those gigs. Moreover, they likely juggled multiple projects simultaneously and had to run the operational side of their business, including time management, resource management, invoicing, contract development, and beyond. A few years ago, finding candidates with an “entrepreneurial mind-set” was all the rage in recruiting. Gig workers often enter companies with this unique skill set, and recruiters can be the bridge by better understanding how these unique skills apply to the roles they’re hiring for and communicating those skills to hiring managers. It goes without saying that recruiters are searching for the highest-skilled employees for any given role. In the past, when working with new college graduates, my colleagues and I have made a point to ask them about every job and activity they pursued. When they explained they worked for 30 hours, took 10 hours of classes, and participated in additional volunteer work or extracurricular activities in any given week, it became immediately apparent they were comfortable hustling and managing their time. Recent graduates often don’t think they have anything to add to a résumé and shy away from including their time as wait staff, clerk, or other vocation. Contrary to this belief, it’s actually beneficial for those who have the ability to take on a variety of responsibilities and balance competing priorities to highlight that information in their résumés and in interviews to demonstrate hustle. As a recruiter, it’s helpful to ask about the various components of a résumé to fully understand the bigger story of the individual’s employee journey. This same situation often occurs with professionals returning to work after parental leave or a longer leave of absence from the workforce. They’ve rarely just been sitting at home—most of the time, they’ve been volunteering with schools and community organizations, coaching soccer games, and managing to needs of their families. They’ve definitely been hustling—they just haven’t been getting paid for it. For these people, the stories of their years of hustle should be part of how they position themselves with employers that want to know that their future employees possess core skills—organization, communication, and facilitation—and can juggle multiple activities at once. Owens isn’t an anomaly—he represents a growing trend toward gig workers who are looking to make money, control their career, have more time with their families, and so on. I commend Owens for talking boldly and openly about his passion and commitment for his job. He has since landed new acting gigs from those who understood the power and relevance of the skills he managed to build at Trader Joe’s and through other gigs. Don’t brush gig workers to the side when you’re looking for skilled employees. Instead, treat those prospective employees who have the grit, hustle, and skill set to manage gig opportunities for exactly who they are: employees who probably have the skills you are looking for. Kimberly Schneiderman is a Senior Practice Development Manager with RiseSmart, Inc. where she creates and manages RiseSmart’s coach and client-facing programs, training, and support materials. Prior to RiseSmart, Schneiderman built a specialty coaching practice working with senior officers in law enforcement. She has authored numerous career-related book chapters, articles, and videos, and has appeared on news and radio programs as a subject matter expert. Schneiderman is also an active member of the Career Thought Leaders and The National Resume Writers’ Association.